Owning a paddle board is a great feeling. The first step of owning your own board, is knowing how to carry the board. Stand up paddle boards are awkward, big, heavy … but awesome. Not only do you have to be cautious when carrying your board about not dropping it or hitting it on anything, but you also have to be cautious about yourself and not hurting your back or pulling anything. So once you learn the different ways on how to carry your board properly, you will be able to carry it for a short distance, long all the way down to the beach and how to put it on top of your car. 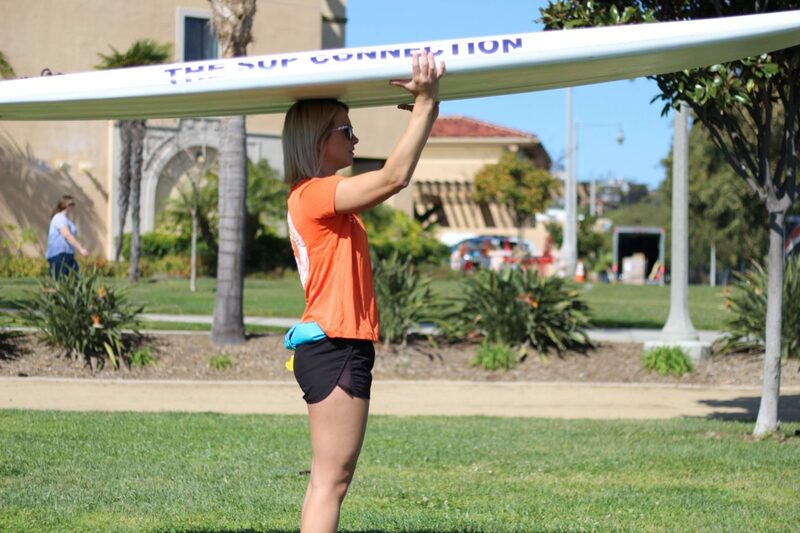 The most basic technique of picking up your paddle board is by the carrying handle that is generally located in the middle of the board. If there is no handle, there is an insert to grip with your fingers. When picking up your board by the handle or insert, make sure you have a tight grip, relax your shoulder and hug the board tight to the side of your body. The other technique is to carry the board on top of your head, this is an easier way to carry your board for a longer distance or to put on top of your vehicle. To do so, carefully lay the board on a ground and pick it up by the tail. Then, walk your hands on the bottom of the board until you have reached the center. Place the board on top of your head, move your hands to each side of the rail of the board. To gain momentum, slightly push the nose of the board upwards by using your foot. This is an easier way to carry the board since the weight of the SUP is distributed throughout your entire body and a lot easier to place the board on top of your vehicle. ** key tip, wearing a hat will add a little cushion between your head and board.